This article is about a project that was cancelled or put on extended hiatus. openc2e is an open-source game engine for the Creatures games. Development on openc2e began in May 2004. The primary developers are Fuzzie, Nornagon and Bdonlan, with ElasticMuffin, Dylan and others having coded various bits. ElasticMuffin was also responsible for the website and the Windows builds, and Pez for the logo. Many other members of the community participated in testing. It was intended be an engine capable of running all the games in the Creatures series, allowing people to run them on unsupported operating systems and to extend the engine in ways impossible without access to the source code. Note, however, that openc2e is not a game by itself; it needs game content from elsewhere (either official Creatures games or community-created ones) to be playable. Creatures 2 running in openc2e on Windows Vista. It is a project of the Creatures Community Development Network. You can visit their IRC channel (#ccdevnet on Freenode) if you would like to ask questions about the project. The project entered a hiatus in 2010, and the project website is currently down (archived here). The source code is available on github. openc2e does not currently perfectly simulate physics, nor does it completely simulate Creatures themselves. 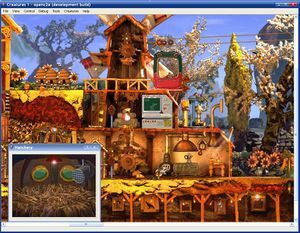 However, it manages to run most of the Creatures 1, Creatures 2, Creatures Village, Creatures 3 and Docking Station agents well apart from physics issues, and accurately simulates the creature biochemistry in those games. Before development stalled, the primary goals were significant improvements to both Creatures 1 and 2 support (which are poorly supported or entirely nonfunctional on many platforms unlike C3 and DS). Additional missing elements at present include network abilities (ie, the Docking Station warp), the majority of serialisation (world saving/loading and creature exporting/importing) and music support beyond a preliminary implementation (thanks to work done by GreenReaper while developing MNGPlayer). 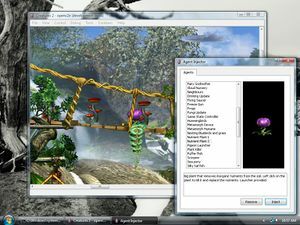 The eventual aim was being able to 'emulate' near-perfectly any of the Creatures engines, and hence run all games in the Creatures series. It was also intended to be the basis for Freetures and Lifandi. openc2e is an implementation similar to the Creatures Evolution Engine (generally referred to as 'c2e', hence the name), built using C++, SDL, Boost, and the STL. It currently consists of a CAOS parser and runtime (supporting multiple versions of CAOS, to allow support for all of the Creatures series), an implementation of the majority of the CAOS functions, code for simple agents, compound agents and vehicles, a basic physics engine, genome/creature code, and sprite, PRAY, and MNG file support. It is known to run on Mac OS X, Windows and Linux, though the existing builds for Mac OS X and Windows are very out of date. The project also includes some useful tools, such as a PRAY dumping utility similar to REVELATION, a basic Injector Kit, a Brain in a Vat clone, and the start of a genetic editor. CIA activity stats/changelog (down, formerly at cia.navi.cx/stats/project/openc2e) - Useful for observing the latest progress on the project. Bug Tracker - Check this list before reporting bugs! This page was last modified on 3 July 2017, at 04:03.